Dr. Peter Fraenkel, head of the Center for Work and Family, released his new book for couples, entitled Sync Your Relationship, Save Your Marriage: Four Steps to Getting Back on Track (New York: Palgrave-Macmillan), and it has been gaining attention from the couple therapy community and the media. The book has received highly favorable endorsements from a wide range of therapists, as well as prominent musicians, as the book examines how couple problems often center on differences in rhythms, and how to change time patterns to get in sync. The Ackerman Institute hosted a book party for Dr. Fraenkel on Thursday, March 31 which was well attended. Audience included faculty members and center heads as well as Ackerman Institute board members. Students from both the Institute’s training program as well as from other New York City institutions were present. 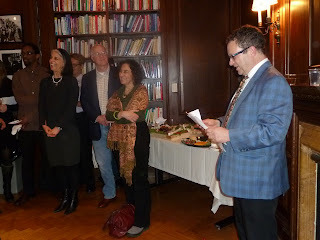 On the evening of April 28, Dr. Fraenkel had the honor of speaking at the Yale Club in an event organized by Ackerman board member Alec Haverstick. After a brief presentation by Fraenkel on the ideas in the book, the audience engaged in a lively discussion about the time challenges for couples and families today. This summer, Dr. Fraenkel will work with some of his Center student-staff to create a workshop for couples on getting in sync. It will be launched at Ackerman in the late fall.